The Control Bar is where advanced in-session controls can be found. To bring up the Control Bar shown below, please tap on the '^' button (located in the lower right corner by default). These 7 buttons are explained below, in order of their appearance on the menu (from left to right). 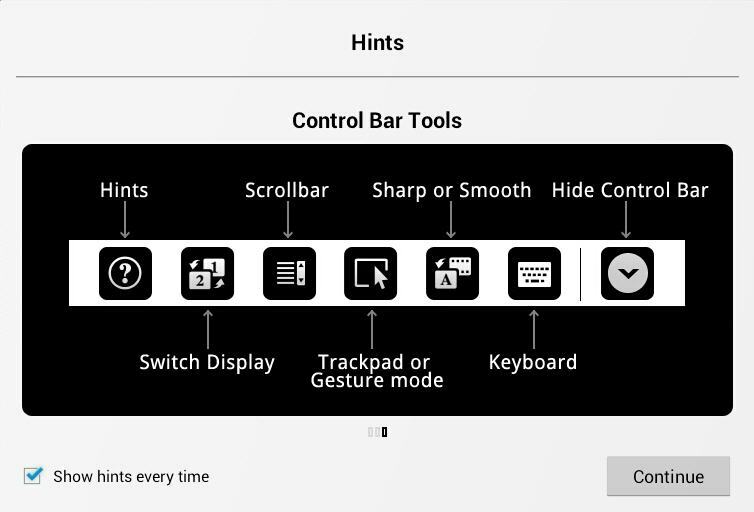 Opens the "Hints screen" showing the available gestures. Provides switching to (and back) from your secondary monitor if your computer has more than one display/monitor attached. Provides the capability to scroll the screen. Trackpad mode provides gesture-like mouse manipulations with left-click or right-click. This is good for opening a hidden bar like the Windows Task Bar or Mac Task Bar. Provides two video modes; Sharp (the default) and Smooth video rendering. Sharp mode gives clearer display quality, whereas Smooth mode gives faster streaming performance but consumes more of the computer's CPU power. Enables the virtual keyboard or bluetooth keyboard (if connected).